Quercus palustris.John Hilty.www.illinoiswildflowers.info. (Accessed 9/2014). Quercus palustris is a tree to 30 m tall; to 90 cm dbh; lives about 100 years, red oak group (subgenus Erythrobalanus); young trees strongly taprooted in well-drained soil, roots associated with ectomycorrhizal fungi (Decker and Boerner 1997), trunk usually single, straight, undivided; lower branches point down, retains dead branches; bark dark gray, slightly furrowed with smooth patches; branches with many short, sharp twigs; winter buds small, hairless, sharp-tipped. Leaves alternate, 5-16 cm long, 5-12 cm wide (Flora of North America 1993+), leaf lobes deep, 2-3 per side, irregularly toothed, usually narrow, bristle tipped, base wedge-shaped to truncate, shiny, dark green above, younger trees tend to retain dead leaves through winter; leaves expand late April-mid-May; winter plant leafless 145 days (Britton 1874). Quercus palustris.bark.John Hilty.www.illinoiswildflowers.info. (Accessed 9/2014). Flowers monoecious, green, male catkins, female flowers 1-few, April-May, wind pollinated. Fruit acorns small, to 1.4 cm wide, cap saucer-shaped, 0.6 cm high, about 1-1.5 cm wide, thin, not much wider than acorn, covering up to 1/3 of nut, scales small, fine (Harlow 1946; Petrides1988), kernel bitter, astringent from high tannin content, matures 18 months, Sept.-Nov. Seeds dispersed Sept.-Dec. by squirrels, blue jays (Darley-Hill and Johnson 1981) and other animals that bury acorns. Acorns eaten by many birds and mammals that do not bury nuts (raccoon, foxes), (Martin et al. 1951; Wilson 1993). Frequency in NYC: Very common. Habitat: Swamp forests and open, wet soil to upland. Often a woody pioneer on poor soil or fill, pH 4.5-6.5 (USDA, NRCS 2010). In NYC found on soils with pH 4.7-5.0 (Gargiullo unpublished data). Young trees stump sprout if cut. Grows rapidly. Intolerant of shade (but more tolerant than Populus deltoides or Salix nigra). Very tolerant of dormant-season flooding, moderately tolerant during growing season (similar to Acer saccharum). Intolerant of salt and alkaline soil (however it tolerates urban conditions and surrounding concrete as a street tree, (personal observation). Moderately tolerant of ozone (Hightshoe 1988). Quercus palustris. By Glenn Dreyer. Copyright © 2015 Glenn Dreyer.New England Wild Flower Society.gobotany.newenglandwild.org (Accessed 6/2015). Notes: Deer and rabbits eat twigs, other animals eat buds (Martin et al 1951). 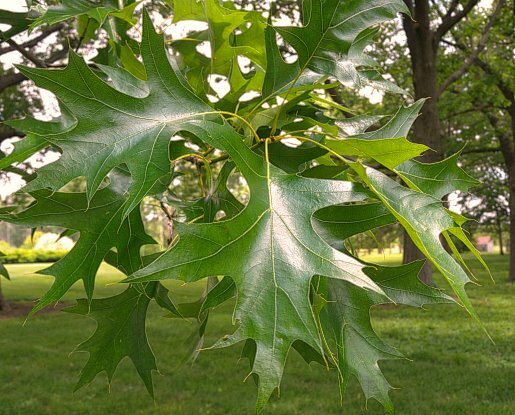 Foliage eaten by Gypsy moth larvae and other insects Susceptible to fire damage and subsequent fungal infections. Susceptible to leaf blister fungus (Taphrina caerulescens), shoot-blight and twig canker (Dothiorella quercina) and pin oak blight (Endothia gyrosa). Attacked by many oak feeding insects, including obscure scale (Melanaspis obscura) and the horned oak gall wasp (Callirhytis cornigera). It is a strongly preferred host of gypsy moth (Lymantria dispar); also attacked by larvae of the scarlet oak sawfly, Caliroa quercuscoccinneae (Hymenoptera), that skeletonizes leaves, adults damage leaves while laying eggs. The larvae are slimy, greenish-black, this insect is preyed upon by the parasitic wasp Trichogramma minutum (Hymenoptera, Trichogrammatidae) which lays its eggs in the sawfly eggs. Protozoans of the genus Herptomonas, are pathogens of late-stage sawfly larvae. 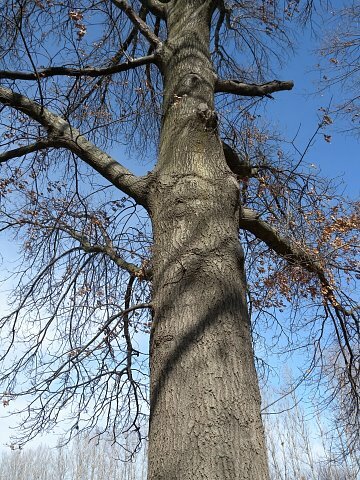 Pin oak is also host to the larvae of Macrodiplosis quercusoruca, a midge (Diptera, Cecidomyiidae) causing vein pocket galls, appearing as elongate swellings with a median furrow along major veins or midrib (Gagné 1989). The twigs of pin oak are often parasitized by larvae of two gall wasps that can cause serious injury or death of the tree. Horned oak gall is a woody, tumor-like gall up to 50 cm diam., studded with thorny outgrowths, caused by Callirhytis cornigera (Hymenoptera). Branches may be covered by strings of perennial galls that are very noticeable during winter. Adult wasps lay eggs on leaf veins and larvae cause small, blister-like galls along leaf undersides from May to June. The next generation of adults, in midsummer, lays eggs in twigs. These galls form fully over two years, at first appearing as rounded, woody blisters along twigs in the spring following infestation. At maturity an adult wasp emerges from each horn of the gall. 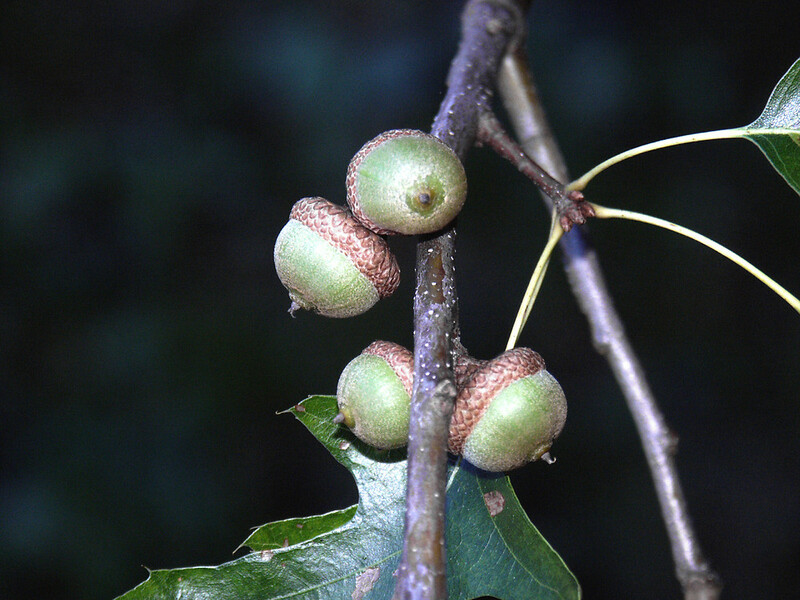 The galls caused by Callirhytis quercuspunctata, are very similar to horned oak galls but lack the thorny outgrowths. In addition to the gall-makers themselves, numerous other insects may inhabit woody galls including several species of parasitic wasp that prey upon the gall wasp larvae, other insects that use the gall but do not interfere with the gall or gall wasps and others that feed on the gall tissues (Burns and Honkala 1990; Sinclair et al. 1987; Johnson and Lyon 1991). (See Q. alba for other insect predators).